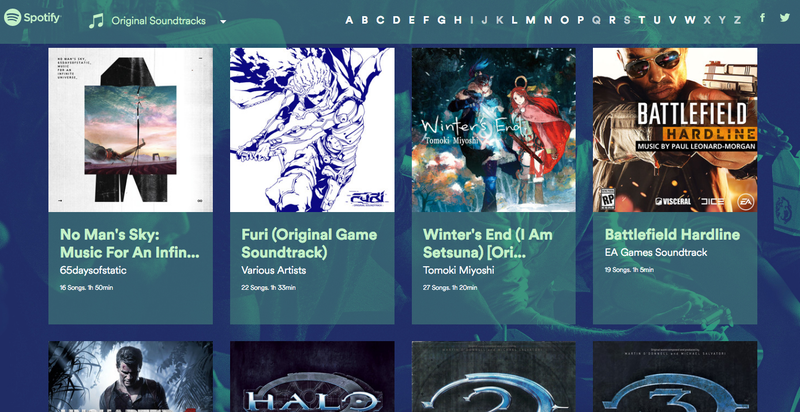 Confession: I love video game soundtracks. Ever since I played Final Fantasy II (IV) on the SNES, I’ve known the powerful part music plays in video games. But in the music streaming world of today, jamming on good game soundtracks—whether from a full game or just a playlist for a quick Dota 2 session—isn’t incredibly intuitive. But Spotify is thankfully giving a shoutout to the gamers with its latest feature. Spotify’s coalesced curated playlists and original soundtracks into one all-new gaming portal. Some playlists are curated by eSports celebrities like Starcraft II commentator Day. Others are general Spotify-sourced jams for specific types of games with some weird names like Heavy Gamer — “for those who like it hard and heavy.” Oookkkk? But the absolute best part of this new portal is Spotify’s one-stop shop for video game soundtracks, ranging a huge swath of orchestral triple-A titles to chiptune indie songs. There are so many good ones on here, but I thought I’d pick my personal top five to whet your appetite. Right now, Spotify’s web portal is only a light tasting of what the service actually offers. For example, Toby Fox’s incredible Undertale soundtrack isn’t in the web portal but is thankfully in its rightful place when you open up the dedicated Spotify app.